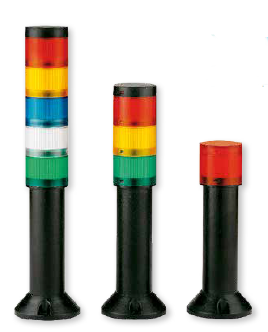 The series 300 stack light is a 30mm (1.25″) diameter light for smaller signaling requirements, but it still uses a highly visible LED. The 300 series can be supplied as a single multicolor lamp (tricolor), or with multiple single color lamps in a stack. Units are stocked with 1, 2, 3, 4, or 5 different colors, and audible units are available as well. The units come with screw clamp terminals for easy wiring.